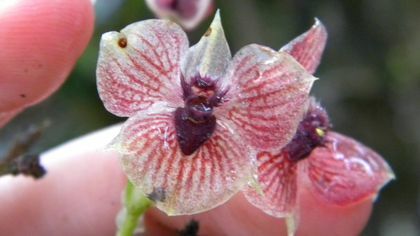 Telipogon diabolicus was named for its flowers' heart-shaped gynostemium, which look like a devil's head. A new species of orchid is in a league of its own - not just because it's relatively rare, but also because scientists say it looks like the devil. In their report on the species' discovery, the researchers noted that the flower has already been listed as critically endangered on the IUCN Red List, which lists animals and plants threatened with extinction. "This species is only known from the type specimens, which represent one location in [a] highly vulnerable habitat near the main road Pasto-Mocoa," the researchers wrote in a study published online July 8 in the journal PhytoKeys. "It is expected that the current reconstruction of this road will have [a] negative impact on the habitat of T. diabolicus." Researchers discovered the new species in 2015while they were cataloging Colombian plants, which included almost 3,600 orchid species representing nearly 250 genera (genuses). "However, there is no doubt that hundreds of species occurring in this country remain undiscovered," the researchers wrote in the study.